Highly reliable, highly productive, easy to start technology. Used for the creation of a round cavity in displaceable soil into which conduits for communication cables, water, gas and electricity can be easily installed. PneuVibe offer two alternative head designs for varying soil conditions. Fixed tapered head for the easy going, soft sandy conditions or the High Impact chiselling head for the hard shale type conditions. PneuVibe tools are manufactured from high grade alloy steels, heat treated to maximum hardness resulting in an extremely long life on the wear faces. Impact moles are equipped with a small quarter turn, air on reverse, self-aligning piston valve and replaceable piston seals. This all adds up to an easy start, easy to use, highly productive tool. 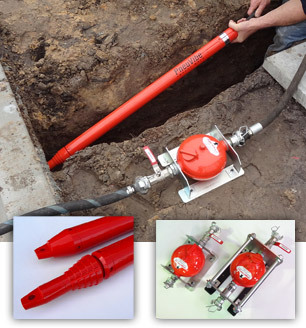 Various easy fit attachments are available for towing of conduits and pipes. PneuVibe also has available pipe pulling carrots, telescopic sighters, range poles and launchers. For enquires please click here to contact us.